Bulgarian archaeologists say that have uncovered the oldest prehistoric town found to date in Europe. The walled fortified settlement, near the modern town of Provadia, is thought to have been an important centre for salt production. Its discovery in north-west Bulgaria may explain the huge gold hoard found nearby 40 years ago. Archaeologists believe that the town was home to some 350 people and dates back to between 4700 and 4200 BC. That is about 1,500 years before the start of ancient Greek civilization. The residents boiled water from a local spring and used it to create salt bricks, which were traded and used to preserve meat. Salt was a hugely valuable commodity at the time, which experts say could help to explain the huge defensive stone walls which ringed the town. Excavations at the site, beginning in 2005, have also uncovered the remains of two-storey houses, a series of pits used for rituals, as well as parts of a gate and bastion structures. A small necropolis, or burial ground, was discovered at the site earlier this year and is still being studied by archaeologists. “We are not talking about a town like the Greek city-states, ancient Rome or medieval settlements, but about what archaeologists agree constituted a town in the fifth millennium BC,” Vasil Nikolov, a researcher with Bulgaria’s National Institute of Archaeology, told the AFP news agency. Archaeologist Krum Bachvarov from the institute said the latest find was “extremely interesting”. 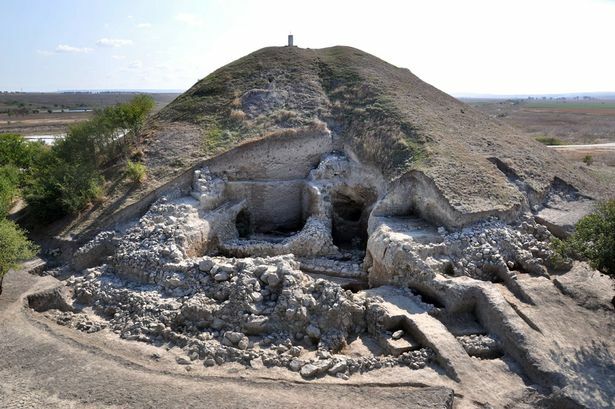 “The huge walls around the settlement, which were built very tall and with stone blocks… are also something unseen in excavations of prehistoric sites in south-east Europe so far,” he told AFP. Similar salt mines near Tuzla in Bosnia and Turda in Romania help prove the existence of a series of civilisztions which also mined copper and gold in the Carpathian and Balkan mountains during the same period. This latest discovery almost certainly explains the treasure found exactly 40 years ago at a cemetery on the outskirts of Varna, 35 km (21 miles) away, the oldest hoard of gold objects found anywhere in the world.